Prominent & Leading Manufacturer from Surat, we offer fire retardant doors. 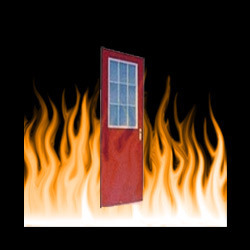 We specialize in manufacturing FIRE-RESISTANT DOORS. We have authorized certificate of Government organization that carries out the testing of fire resistant doors. We have projects going on with many of the government organizations. We use a special design that makes our door better than any other fire resistant doors available in INDIA. Also there is no constraint of the dimensions of the doors.We manufacture as per your needs. Looking for All Type of Steel Doors ?